The issue of Steam Quality greatly impacts the calculations on the actual excess energy in the Rossi/Focardi eCat.. 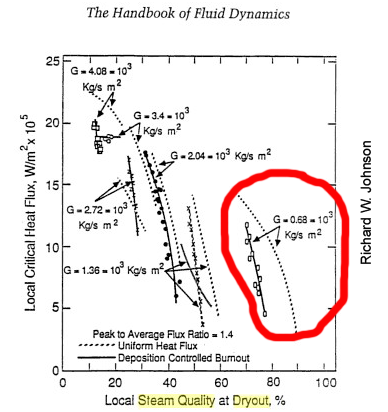 In particular, Appendix 9: NASA Electrical-Power-Only Steam Analysis reviews the performance of the eCat in relation to an Temperature-Entropy diagram, and states that the Steam quality could be any value between 0 and 1, so that the total output power could be anywhere between 770 W (NO excess energy), to slightly above Rossi's claimed value of 4900 W.
This article shows that NASA's analysis omits significant facts about the behaviour of steam. First, we review some basic facts about steam, particularly the concept of steam quality, and the use of a temperature-enthalpy diagram. We then consider the detailed behavior of boiling water in a "Kettle" boiler and a "Tube" boiler. In thermodynamics water is "liquid" or "vapour". But the liquid may be carried as droplets, or as bulk liquid. Following CANDU (seelinks), we will refer to bulk liquid as Fluid water (which may contain bubbles), and the evaporated part as Gas, consisting of water vapour which may contain drops of liquid water. In a tube boiler, such as the eCat, the distribution of liquid water and water vapour depends directly on the Steam quality. As steam quality increases from 0 to 1 the flow changes in stages from pure fluid, bubbly fluid, plugs of gas/slugs of fluid to an annular arrangement of fluid water and vapour containing droplets. At a specific steam quality a "Dryout" occurs : there is no more fluid water in the output. Any remaining water will then be carried as droplets in the water vapour. This "Dryout Point" is estimated by the author to be between 75% dry and 80% dry. 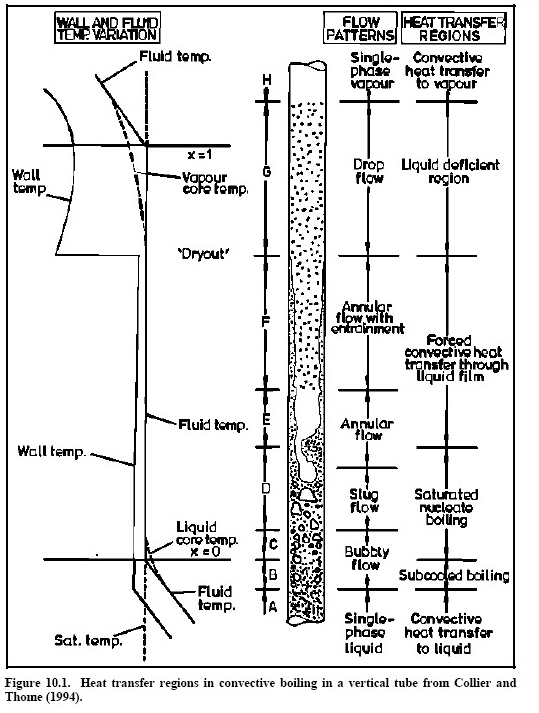 If the eCat is operating with a steam quality BELOW the dryout point then fluid water will eventually fill the chimney and flow out of the outlet hose. If the eCat has steam quality ABOVE the dryout point, then the chimney will empty, and there will be no fluid water in the outlet hose. The conclusions depend on whether the eCat is full or not. Cantwell's eCat simulator is operated at three input flows, which appear to show a change from below dryout to above dryout. Lewan reported in the March experiment that some water was leaving the outlet hose, and approximately half the input water was collected. There is no estimate of what proportion left the eCat as fluid water, what condensed in the hose, and what was condensed in the "sparge" bucket. If all the collected water was overflow fluid, then the eCat dryout point is above 50% Dry. For the January experiment Galantini reports that the chimney was dry, that the steam quality was correctly measured, and that the eCat was therefore not overflowing. TWO of these experiments (Lewan's April experiment and Cantwell's simulator) were operating BELOW the dryout point. THREE of these steam experiments (January, March and Krivit's demonstration) show that the chimney is NOT full of water, and that significant amounts of fluid water are NOT in the outlet stream. If that is so, then the MINIMUM steam quality is thus ABOVE the dryout point, which means that the steam quality is above 75% Dry, and the total power in Krivit's demonstration is over 4300 W, much larger than the electrical input of 770 W.
Note 1 : this is a working draft. Some of these calculations have been "eyeballed", and will be replaced with more accurate numbers. Check back frequently for updates. Note 2 : when researching "dryout" be sure to distinguish between "local dryout" (eg Leidenfrost), and "total dryout", when there is no more water. 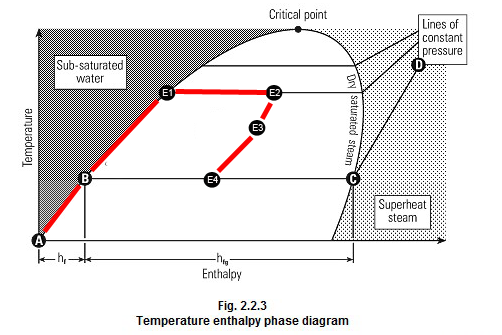 NASA's Temperature-Enthalpy chart presumes that the entire eCat was operating at atmospheric pressure. Internally, the actual reactor chamber might be operating at a higher pressure, requiring more energy to reach boiling point. Lewan's statement "The measured value was 99.6 °C. All values above this should indicate that the probe is not submerged in water." is incorrect (or incomplete). In fact, it means either that the pressure was above ambient, or that the steam was superheated (completely dry) at or above atmospheric pressure. The following links are recommended. Individual sections are referenced in the text. Wolverine Tubes : Engineering Databook III (or A copy which works better in some PDF readers ). The official, international definitions of Steam : The International Association for the Properties of Water and Steam. 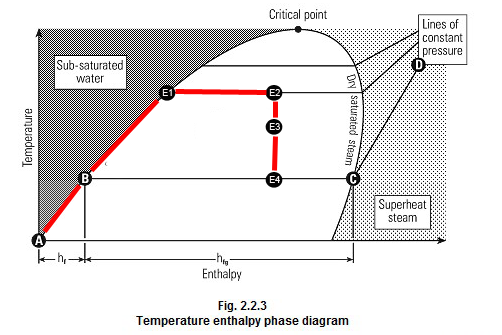 The vertical axis is temperature, and the horizontal axis represents the energy added (usually expressed as enthalpy). Start at point A, with liquid water. As you add heat the water warms up, and you will move towards point B. What happens next depends on the pressure. When you reach point B, for a particular pressure, the water will start to boil. As you add more heat the temperature will not change, and you will move a point X horizontally towards point C. Along this line, you will have a mixture of water vapour and liquid water. 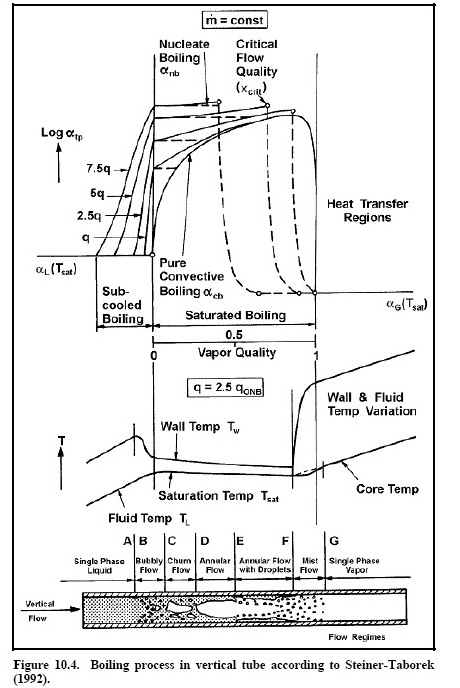 The ratio of the mass of of the vapour to the total mass is expressed as the Quality of the steam, X, which varies from 0 (point B) to 1 (Point C). This Quality is expressed as a fraction, 0.95, or sometimes as a percentage -- eg "95% Dry" or even as the percentage of liquid water "5% Wet". When you reach point C there is no more liquid water, and the steam is said to be completely Dry : Quality 1.0, "%100% Dry" or "0% Wet". After point C the temperature will start to rise again, towards point D.
As before, the vertical axis is temperature, but NASA has kindly scaled the X energy axis to indicate the power (W) required to raise the known volume of water (7 litres/hour) to the specified temperature. The input power of 770W (for the Krivit demonstration) is enough to raise the water above boiling point, to what looks (by eye) to be about 5% Dry. 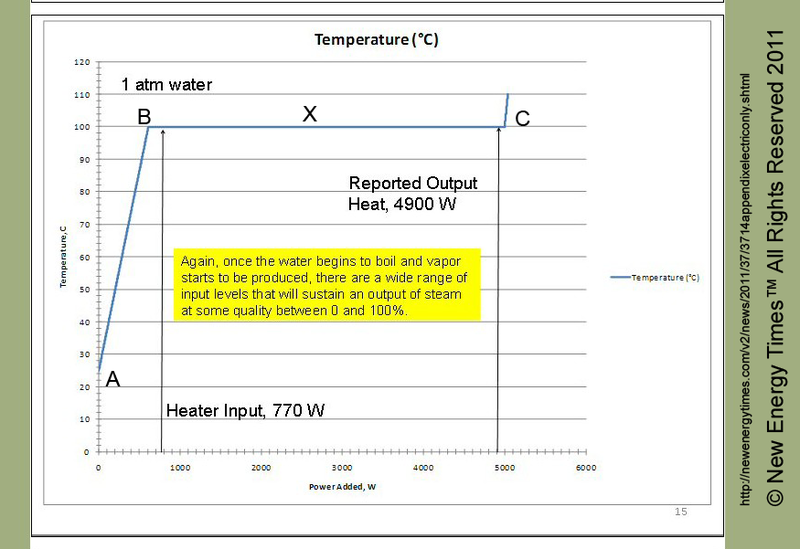 Rossi calculated the energy, based on a quality of over 95%, to be 4900 W.
The measured temperature of the steam at the output is reported to be at boiling point. So we have not yet entered the region of superheated steam (C-to-D on the first diagram.) The total energy input of 770 W includes 30W (measured in some of the experiments) to power the control box, and neglects any losses inside the eCat, which Rossi estimates at 80 W (assuming a 4900 W output). NASA claims that the point X could be anywhere between the 770W mark (the electrical input energy), and the 5000W mark. On a theoretical basis, this is true. The actual output of the eCat could be in serious doubt. 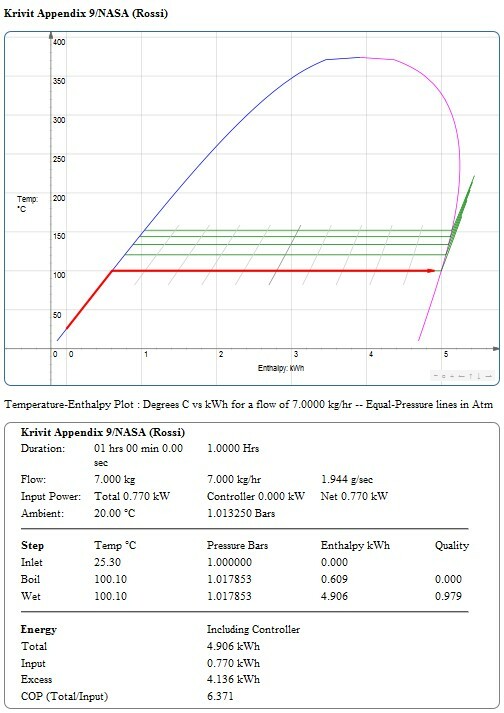 An eCat Steam Calculator is in development, which shows a Temperature-Enthalpy diagram and computed results for an ECat experiment. where P is the pressure, V is the volume, N is the number of molecules, k is Boltzman's constant, and T is the temperature (In degrees Kelvin, ie starting at absolute zero). Since the volume of steam at atmospheric pressure is about 1700 times larger than the volume of water, the overall calculation uses the volume from the vapour only, and presumes that the drops of water are just carried along with it. It is sometimes convenient to consider the quality by the Volume of the liquid (Vl) and vapour (Vv). This is called the "Void Fraction" (The NASA paper calls this the "Volume Fraction"). Everything you need to know to analyze an eCat (or a conventional nuclear reactor!) is in here : Introduction to Thermodynamics (You can skip the stuff about pumps). THAT's easy enough, right? Yeah ... right. Everything is complicated, nonlinear and/or not fully determined. As an interlude, let's see what happens in the familar case, when water boils in a pan. You put a pan on a heater. Bubbles start forming on the bottom. Then they form streams, which reach the surface and break. Finally, you have a roiling, frothing boil. A couple of videos are here and here. As usual, it's very complicated, and goes through several stages. First, isolated bubbles appear. Very small bubbles are dominated by surface tension. 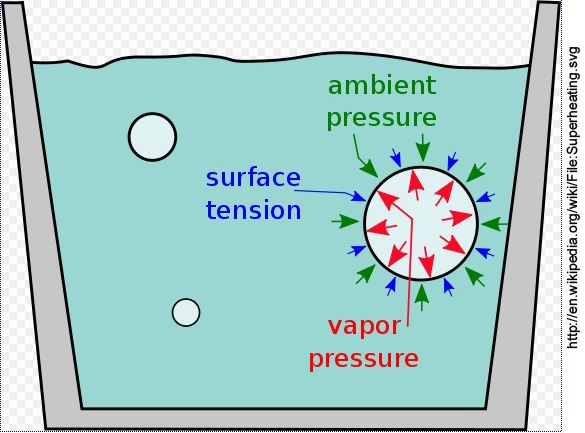 In fact, the pressure inside a small bubble can be much larger than the ambient 1 atmosphere pressure. The bubbles might not even rise to the surface. In an industrial kettle boiler the water increases slightly in volume, and is said to "swell". As bubbles get larger they rise to the surface, often streaming from a nucleation point. This zone is also referred to as Superheating. The bubbles get larger, and can form tubes, reaching the surface. In a final stage vapour can form between the liquid water and the film, reducing heat transfer. This is the Leidenfrost Effect, which causes a droplet to skitter on a hot surface. There is general consensus [links..] that a kettle boiler will produce 95% Dry steam. The Rossi eCat is clearly not a kettle boiler. It is a form of Tube Boiler, complicated by the coaxial "bulge" around the reactor core, and the fact that we don't know for sure how the heat transfer works. Note the progression from Single-phase-Liquid (Fluid), to Bubbly Flow, Plug Flow, Slug Flow, Wavy Flow, Annular Flow and .. at the extreme right -- where there is no more FLUID, drop flow and finally, when the Steam Quality reaches 1 -- superheated steam. On the right the vertical axis describes the physical height along the tube. On the left the vertical axis is the Steam Quality X. Above a specific position marked "Dryout" there is NO MORE fluid water. All the water is carried as drops in the vapour. 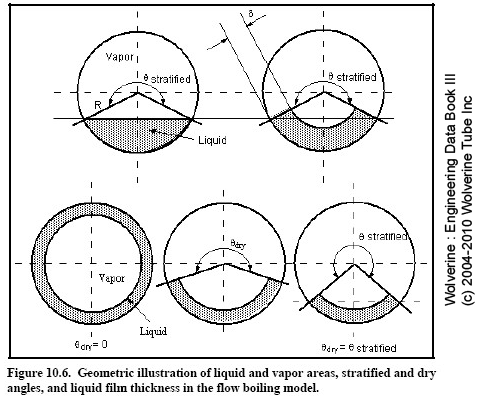 The following diagram specifically scales the steam quality to the flow diagram and identifies the Dryout point "F", at a steam quality of approximately 80% Dry. The conclusions of this paper are effectively obtained from these diagrams. If the heating section stops at a particular point, it is presumed that the final "flow" will continue in the same mode. In the ecat there is a change from horizontal to vertical flow: any "pooled" fluid water will revert to annular (or even slug) form. Dryout occurs at some definite value of Steam Quality, Xdryout . Based on the Vertical diagram it appears to be at about 75% Dry. See the section of Flow Regimes for more information on the Dryout Point. 2. A "Start" heater (probably more than 300W) raises the water temperature. 4. 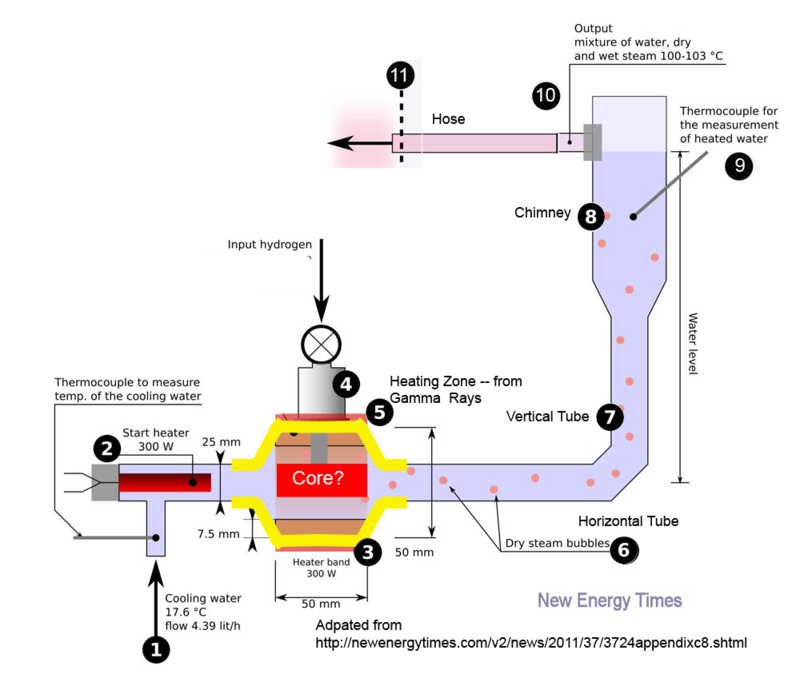 Hydrogen is introduced into the reactor core. 5. If the eCat is real, additional heating is produced by gamma rays, probably as they are absorbed in the copper pipe and/or the surrounding lead shielding. This section acts substantially as a tube boiler. 6. 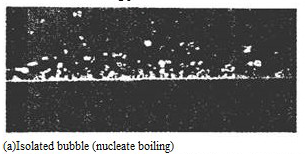 Water exits the reactor in the horizontal tube. The flow in this section depends on the Steam Quality. (Liquid water, bubbles, slugs, annular, drops ..). 7. The output tube becomes vertical. The flow structure is maintained, again depending on the Steam Quality. 8. It then expands into a chimney. Slugs or bubbles of vapor may become separated from any fluid water. 9. An instrument port penetrates the chimney, below the output level. 10. The output from the eCat is a mix of Fluid Water, Water Vapour and Drops of Water. 11. The water exits through a hose. Cooling in this section will result in a different Steam Quality and flow type at the end of the hose. For each experiment the results are recomputed (and are in general reasonably close to the original reports). The amount of water coming out before boiling was clearly larger, and this was initially measured. If the steam quailty was very low then this would have produced 11 litres of water (almost 3 gallons). Condensed water and vapor from outlet hose was collected in a plastic bucket with the hose submerged in the water most of the time. Vapor bubbled from the hose under the water surface. After the test the mass of the water was about 5.4 kg. Unfortunately it isn't possible to determine from this how much fluid water came out of the hose, and how much was from drops in the vapor, or from vapour condensing in the bucket. Lewan doesn't even state whether the bucket was emptied after the eCat warmed up. The experiment is analyzed both with the original assumption, and taking the amount of output water into account. A higher flow rate (7 litres/hr) was used for the Krivit demonstration. Our analysis shows a possible energy gain of one to two times. In other words, Rossi’s device probably produces Watts, not kilowatts, of power. It may, in fact, produce zero excess heat. We cannot know with confidence because of the poor data collection and reporting. 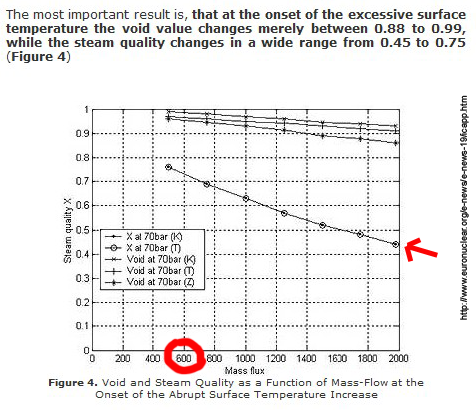 The NASA document (appendix 9) implies that any steam quality from 0 (zero excess heat) to 100% is possible. Before showing Krivit the steam outlet, Rossi emptied the outlet hose down the drain. There is no way to know how much water was in it, and when it might have accumulated. The fact that the hose did not "percolate" (see below) indicates that the eCat was probably operating above the Dryout point. 7. Rick Cantwell's simulated Rossi reactor. A) 800W input, with NO input water flow. This is operating as a KETTLE Boiler, and produces Gas only (Water vapour and drops). The fact that there was no (or only a little) fluid water in the outlet means that there was very little condensation in the outlet hose. This is operating as a TUBE Boiler. The fact that there was lots of fluid water in the outlet (and still little condensation) means that it was operating BELOW the Dryout Point..
With a lower mass flow the eCat-simulator can progress further along the pipe/flow regime, and LESS fluid water goes down the hose (takes longer to "percolate"). But it is still operating below the Dryout Point. This experiment confirms my "Dryout Point" hypothesis. The "Percolator" effect indicates that the outlet hose was operating in "slug" mode, namely alternating between gas and fluid. The vigour with which the slug exits the hose indicates that Rossi was wise not to let Krivit look down the hose! The eCat can be described as a tube boiler. The nature of the flow in the vertical and horizontal tubes depends on the Steam Quality. There is a definite Dryout Steam Quality -- Xdryout -- estimated (by this author) to be between 75% Dry and 80% Dry. If the eCat is operating BELOW Xdryout , then the flow contains fluid water: the chimney will fill with water and overflow down the outlet hose. If the eCat is operating ABOVE Xdryout , then there will be NO fluid water in the output. The following is an attempt to obtain a numerical value for the Steam Quality at Dryout. First, we need to consider flow regimes. Wolverine Ch 10 analyzes the boiling stages, including the dryout point. Several different methods (and equations) are presented. Baker (195X) was the first to formulate flow regimes in 2-phase mixtures (a gas and a liquid) -- initially for the oil industry -- showing the type of flow on a map of Gas Flow (vertical) against Liquid Flow (Horizontal) -- in units of mass/(area second). Corradini warns that the terms used in considering gas flow are NOT the same as those used in thermodynamics. In particular "Quality" is NOT "Steam Quality". 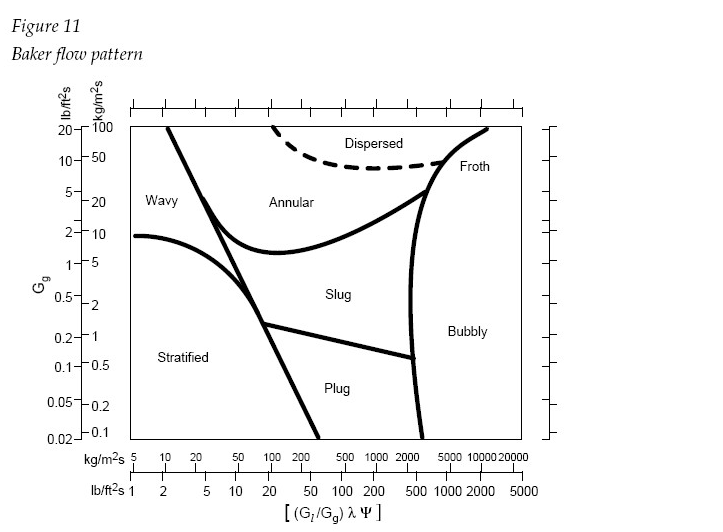 And in this diagram "Bubbly" means bubbles created by the vapour blowing through the liquid, and "dispersed" (or "mist" in some versions) means droplets created by the "wind", not by evaporation. 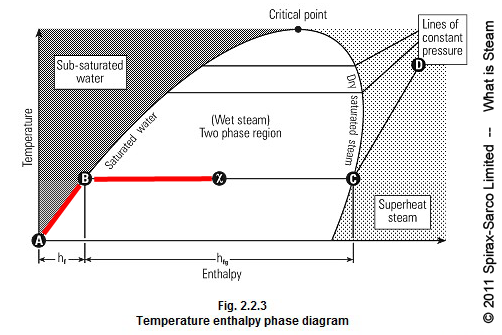 This flow diagram does NOT apply directly to the water-steam case, where the medium can change from one phase to the other. But we can get a subjective understanding of the general principles. 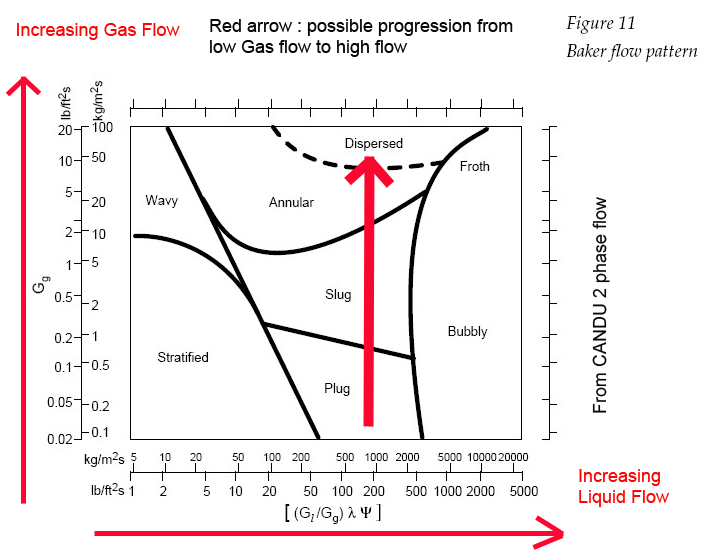 The broad red arrow shows a possible progression of Steam Quality from pure fluid flow (off the map at the bottom), through plug, slug, annular and dispersed modes, to pure vapour flow (off the map at the top). Note that dispersed flow only happens at very high gas flows. (This will be used later to argue that atomization at low steam quality is unlikely). Its interpretation of the use of this diagram in the eCat is left as an exercise for the reader. This is followed by several pages of equations and correction factors. Recent papers have moved to numeric simulations. CANDU (p 28) : "Two phase flow is an area of continuous research and development. The introduction of new calculation tools does not prevent the necessary knowledge of experimental results on which the numerous correlations are based on. The careful selection of the solution scheme along with the use of appropriate correlations is of utmost importance when solving two phase phenomena." These, and the associated calculation of the dryout point, depend on a large number of factors (including power flux, surface roughness of the tubes, slip ratios, 2-phase friction ...) which are beyond the expertise and resources of the present author. 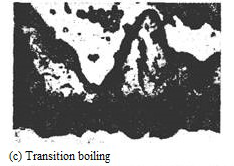 The author's use of the dryout point as "75% to 85%" remains an estimate of what might be obtained in a typical tube boiler. The following are papers which give specific numbers for the Dryout point. The author does NOT know if they are directly applicable to the ecat environment. The ecat mass flow is around 600 kg/a m2 sec for the Krivit demonstration. 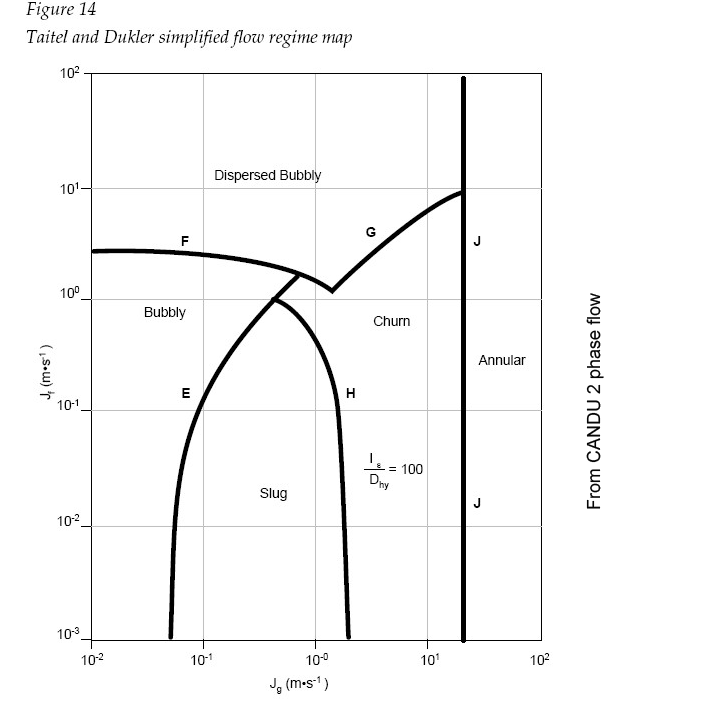 This paper by Kandlikar isn't directly related to the eCat, but it does have a review of flow and Dryout calculation and diagrams of various forms of 'local' dryout. This paper 2006 International Congress on Advances in Nuclear Power Plants is primarily for very high pressures of 70 bar (vs 1 bar for the eCat) gives X in the range of 0.45 to 0.75. 9.4. The Tube Boiler Revisited. Vapour forming the Void "V" (including large bubbles where surface tension is negligible, so pressure is ambient). The initiation of each stage is associated with a specific Steam Quality and a specific volume of Fluid. In the absence of a direct measurement of Steam Quality, the amount of Fluid leaving the eCat can be used to set limits on the Steam Quality. NASA's analysis assumes that the pressure is constant through the system. When a coolant expands or contracts because of heat exchange, it has to accelerate as it travels through a channel. There will therefore be a force F equal to the change in momentum of the fluid. This force equals an acceleration pressure drop times the cross-sectional area of the channel. 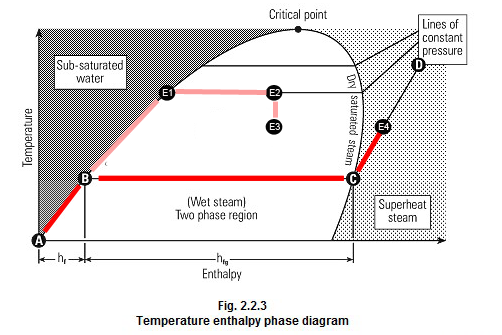 This pressure drop is usually small in single-phase flow, but can be quite large in two-phase flow. This is partly due to friction with the walls and, if the eCat is full of water, gravity. Again, the author regrets he is unable to derive numbers for the eCat. (Afterthought: Actually, 9 of the 10 parameters are readily available properties of water, and only the "roughness" factor is unknown. Most of the current work relates to nuclear reactors, where the pressures and mass flows are very high). The pressure near the reactor core is higher than atmospheric pressure. Therefore the eCat goes A-B-E1, where it starts boiling, at a higher temperature than atmospheric. It then moves horizontally from E1 towards E2 as the input energy is increased and the Steam Quality changes with it. But as it flows through the horizontal and vertical pipes of the eCat and into the wider chimney, it expands adiabatically (a vertical line on the E-H diagram) to a lower pressure at point E3 -- which is the instrument port-- still above atmospheric pressure. It finally exits through the hose, and drops to atmospheric pressure at the end of the hose, at point E4. We have temperatures for A (input water temperature), E3 (Instrument port) and for the boling point of water, E0. In progress ... I'll get a properly scaled EH diagram and do some calculations. Since point B on the NASA chart is very close to the measured electrical energy (particularly if we subtract the power of the control box) I expect that the temperature at E1 will demonstrate that the eCat MUST have been producing excess energy in order to boil any water. Lewan does not report a temperature for E4 -- concerning the outlet, he says "and was thus at a slightly lower temperature". The temperature probe was initially checked submerged in a pot with boiling water. The measured value was 99.6 °C. All values above this should indicate that the probe is not submerged in water. That appears to the author to be incomplete. All values above the boiling point (at atmospheric pressure) indicate that the steam was completely dry, and was Superheated (Point E4). Of course, the boiling point of water depends on the atmospheric pressure, and Lewan's measured 99.6 depends both on that and on the accuracy of the thermometer. Lewan used a single instrument, with two calibrated probes. Use Lewan's reported number and deduce the atmospheric pressure at Bologna. For the time being, I'll use Lewan's numbers with a correction offset which I'll initially set to ZERO. I confirm that the measured temperature always was higher than 100,1°C and that the measured pressure in the chimney always was equal to the ambient pressure. but NO callibration was done for the instrument in a pan of boiling water, and there was no attempt at measuring (or even observing) the hose outlet, so it is not known if the eCat was overflowing or not. This statement also implies that the steam was superheated, and therefore completely dry. However, Galantini is adamant that he was correctly measuring the Steam Quality (by mass), and that the instrument port was dry. The 100 °C temperature is reached at 10:42 and at about 10:45 all the water is completely vaporized found by visual checks of the outlet tube and the valve letting out steam from the chimney. The chimney usually starts full of water, and overflows down the hose as water is pumped in. If the eCat is operating below the Dryout point then the chimney will continue to overflow, and any gas (Vapor + Drops) will bubble up through it. Because there are no nucleation sites, the vapour component of the steam in the horizontal and vertical pipes may in fact be superheated. Once there is only gas emerging from the reactor, there might be a reverse-flow of fluid from the Chimney down the vertical tube, which will be evaporated by the passing superheated steam. Even if the chimney starts full, superheated steam bubbling through it will evaporate it. This would probably have to be determined by experiment. There are heat losses along the hose, which can be analyzed based on its diameter, thickness and thermal conductivity. However, this may not result in much condensation in the hose, because steam vapour requires a nucleating site to form drops. The bulk of this occurs on the inner surface of the hose, forming drops which join into fluid water. The Cantwell eCat simulator showed little or no condensation when it was operating above the dryout point. 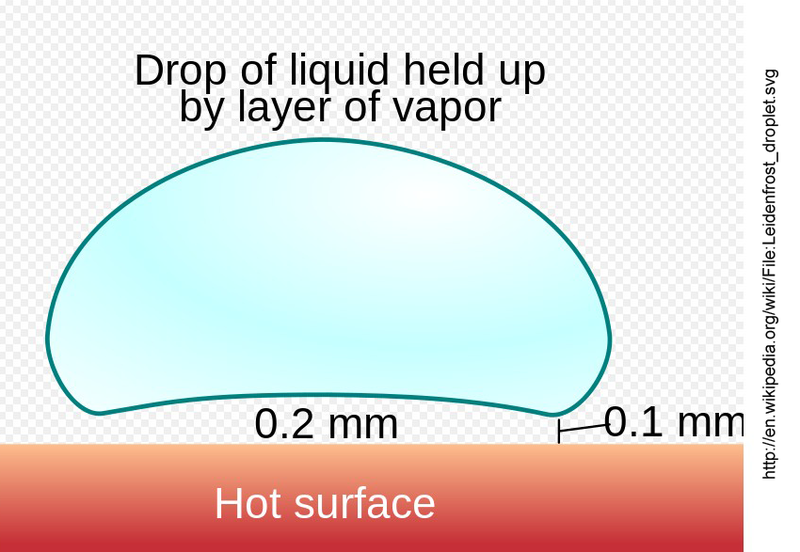 Vapor which is not at a nucleating site can become supercooled, below the nominal thermal equilibrium. Several of Krivit's appendices calculate the volume of steam at the end of the hose and, considering the radius of the hose, the expected velocity of the steam. Comments have also been made about the appearance of the steam. Since this can only be estimated by looking at Krivit's video (and various web "boiling" experiments) this author doesn't have enough information to analyze it in a meaningful way. Any of these are visible only if Drops of a particular size (and number) are present. 10-50 microns -- invisible in small quantities, but scattering of light may make them appear milky in large numbers. The distribution of drop sizes is also relevant to determine if naturally or artificially atomized drops could convey COLD water out of the eCat. Since Drops can be suspended in a Gas (Water Vapor or air) as a colloid, there is probably an easily calculated maximum drop size. Try to calculate the Drypoint and/or find references to it. Some distinguish between local or partial dryout (eg under a slug or annular film) compared to total dryout, which is what I'm using. The reported qualities for local dryout still have fluid water. Next up : Some have suggested that even at very low steam quality (5% Dry) the fluid water could be atomized and carried out with the vapour flow. I'll try to quantify this.